A report by the Ministry for Housing Communities and Local Government (MHCLG) has revealed that Energy Performance Certificates for new build properties in England increased by 10% in September 2018, compared to the same period in 2017. 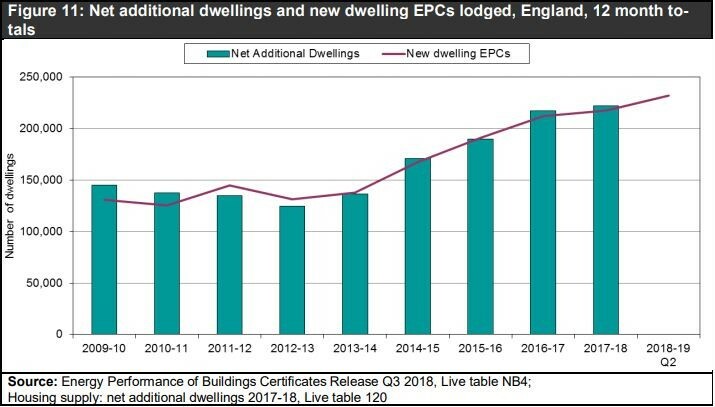 Figures show that there were 218,000 EPCs lodged for new dwellings in 2017-2018, compared to 232,000 during 2018- 2019. The greatest increase was in the period 2014-2015 which saw a rise of 21% change from the previous year. The number of EPCs lodged for new dwellings is larger than new build completions, as it comprises of new build dwellings plus dwelling conversions and change of use of an existing dwelling. Interestingly the difference between these two figures has widened in the past 10 years due to an increase in the number of new dwellings created through change of use. In respect to the types of dwellings being created, houses made up 77% of new build dwelling completions during the 2017-2018 period, which is the highest proportion since 2001-2002. Data obtained from National House Building Council show that the lowest rates for housebuilding was 2005-2006 where flats nearly made up 50% of dwelling completions. This latest report released by MHCLG is fantastic news for On Construction assessors and those working within the building compliance industry. The strong upwards trend will provide more opportunities for Elmhurst members, and reinforces both the value of the EPC and the high standards of work they deliver.